Straight teeth and a revitalized smile may no longer need to come from a mouth full of unattractive wire and bracket braces. Enhancing self-esteem and physical confidence, invisible braces offer an esthetic and barely visible alternative to conventional wire/bracket braces. The clear aligners (also called clear braces) are manufactured using advanced computer technology that predicts tooth movement, making it possible for the removable orthodontic appliance to gradually straighten teeth. Invisible braces are not recommended when baby teeth remain. 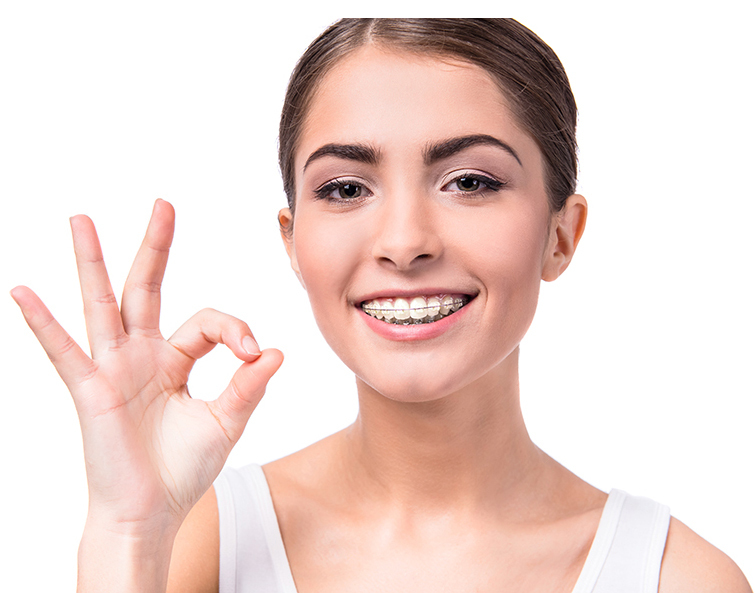 Children and younger teenagers faced with orthodontic problems will require traditional metal braces with brackets/wires on the front of the teeth. However, only your dentist or orthodontist can determine if you are a candidate for invisible braces. The clear aligner treatment was designed primarily for adults due to the need for absolute and rigid cooperation; the trays are worn 22 hours per day and should not be forgotten or lost. Popular types of cosmetic braces include ceramic brackets, inside braces and clear aligners. Ceramic braces are just like metal braces, except that they use tooth-colored brackets (and sometimes tooth-colored wires) rather than metal to straighten teeth. Generally non-staining, the tooth-colored ceramic "blends" with your teeth, making them less noticeable than metal, but not as "invisible" as inside braces or clear aligners. Inside braces — also called inside invisible braces, lingual braces or "iBraces" — and clear aligners go one step further, making treatment virtually invisible. Each alternative has its advantages and disadvantages. "Ceramic, or "clear," braces are made of composite materials that are weaker and more brittle than metal braces. Ceramic brackets are larger than metal brackets and require small rubber bands, or ligatures, (or built in spring clips on "self ligating" brackets) to hold them to the arch wire. Because the ligatures are white or clear, they can stain. However, staining is not a big problem because ligatures are changed every time you get an adjustment (generally monthly). The "self ligatiing" clips do not require retying with wires or elastics. Also like metal braces, ceramic brackets are not removable until treatment is completed, can produce irritation and discomfort, and may complicate regular tooth care, eating and speaking. Because they are not as strong as metal braces, clear braces require a longer treatment time, since your orthodontist may need to apply a slower, more gradual force to ensure the strength capabilities of the clear brackets are not overtaxed. 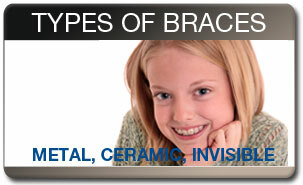 Ceramic brackets also are usually more expensive than traditional metal brackets (about $500 more). As a cost-saving measure, some patients may opt to have ceramic braces placed only on the most visible teeth — typically the upper teeth or just the upper center teeth — while using traditional metal brackets on the remaining teeth that need straightening. Also, there is some possibility of tooth abrasion if the incisal edges of the upper front teeth touch the lower ceramic brackets.